What Does It Take To Turn You On? After two warmup gigs at London’s 100 Club and the Manchester Ritz, a re-formed Suede played the Royal Albert Hall last night (March 24) as part of the Teenage Cancer Trust Series. I know, I know. Another Suede post? I will not proselytize but I will not apologize. Judging from the comments I’ve seen on posts, Youtube and Twitter, people were pretty universal in their praise for the gig. Although Michael Marotta of Vanyaland commented on how oddly unmoved he was after watching video of the band’s performance of ‘Metal Mickey’ (warning! 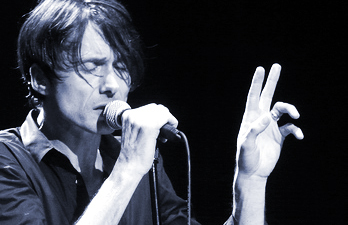 there is excessive pogoing by Brett Anderson). Fair enough. They certainly don’t hold the danger or the mystery they once did and while I also can’t argue original guitarist Bernard Butler’s thoughts about wanting to move forward rather than rehash past glories, I think for certain bands, a brief return can be a welcome thing. For the band and the fans. It certainly seemed like that was the case for both at the RAH on Wednesday night. Flooded with good memories! Suede does indeed turn me on!